The students from the area that is now served by Smith School formerly attended Hagar School. As more families moved to the area, Hagar School could not accommodate the increase of pupils so a new school was built on Oakes Road. On December 5th, 1960 the ratepayers approved the construction of a six-room school at the cost of $150,000. The architects were Kyles and Kyles of Hamilton and the builders were there Heeringa Brothers of Stoney Creek. The land was donated by Mr. C.A.P Smith, a United Empire Loyalist who was the original owner of the farm on which the school was built. “Moved by Mr. Thompson and seconded by Mr. Palmer that the school on Oakes Road be named "The Smith School," as a tribute to the important part the Smith name has contributed to the township." Smith School served the pupils who lived on Oakes Road and West to the Lincoln County border, while Hagar served the pupils who lived on Hunter Road East to Kerman Avenue in Grimsby. 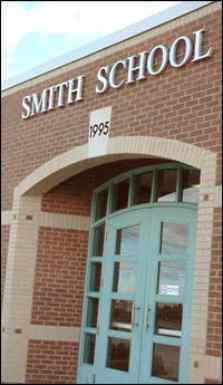 At Smith School, Mrs. Constable was supervising principal from November, 1961, which was the grand opening, to June 1962. Mrs. McCollum was assistant principal and became principal the following year. In 1985, when Hagar School closed, Smith School received students from Kerman Avenue to Kelson Avenue. At that time, our enrolment went up from 138 students in 1961 to 221 students. When our school was built, it was in a very rural part of Grimsby, where there was not much coming or going. Not many families had lived in the area before the Second World War, but among those who did and attended our school were the Maguires, the Arkells, the Eassons, the Temmys, the Hootons, and the Waters. PlaygroundSmith School started out with Kindergarten and four classrooms. The extra classroom was used as a playroom in place of a gymnasium. As the enrolment of Smith School increased, it became necessary to use the playroom for a classroom. In the winter months, Smith students were bussed to Our Lady of Fatima and Winona Gospel Church for Physical Education classes. In the spring of 1993, a 1.7 million dollar addition with three classrooms, a library, a gymnasium, offices and a staff room was approved. Thanks to the hard work of Jack Saddler, Principal of Smith School at the time, the project was completed and the opening ceremonies for the new addition were held on April 11, 1996. In September 2006 a portable was added to Smith School and then another in September 2007. We have approximately 145 students at Smith Public School from Junior Kindergarten to Grade 8 . Smith features a beautiful library, large computer lab, gymnasium, 10 classrooms, 2 portables, sports fields, playground equipment, an outdoor classroom, and YMCA Daycare is offered before/after school on the premises.